lt;stronggt;COX30649lt;/stronggt;lt;BR/gt;Clorox Broad Spectrum Quaternary Disinfectant Cleanerlt;BR/gt;EPA-registered disinfectant kills 90 different pathogen strains, more high-risk germs of concern than most quaternary sprays. Quick-acting formula neutralizes most organisms in two minutes or less, significantly faster than most of the competition. 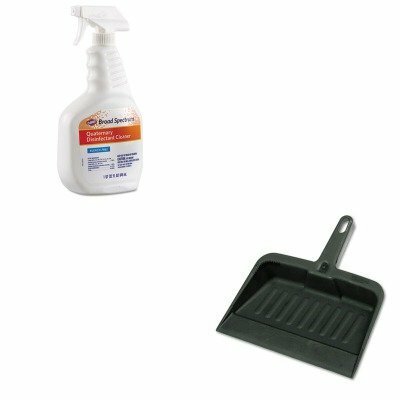 Dual-action product cleans as it disinfects no precleaning required. Powerful cleaning agents cut through grease and grime. Application: Disinfectant/Cleaner Applicable Material: Ceramics Cement/Concrete Enamel Fiberglass Glass Grout Laminates Metal Plastic Sealed/Engineered Stone Vinyl Dirt Types: Bacteria Fungus Germs Grease Grime Mildew Mold Organic Matter Viruses Water-Based Soil Scent: Fragrance-Free.lt;BR/gt;lt;BR/gt;lt;stronggt;RCP2005CHAlt;/stronggt;lt;BR/gt;Clorox Broad Spectrum Quaternary Disinfectant Cleanerlt;BR/gt;Handy dustpan features a tapered front edge to help simplify sweeping-up. Heavy-duty, moderately flexible plastic provides commercial-grade durability. Lanyard handle-hole allows you to hang and store the pan out of the way. Material(s): Polypropylene; Width: 8 1/4quot;. ~ Includes one dustpan.